B & M Garage Door Inc specializes in the sale, installation and repair of the majority of garage doors and openers available in the area in and around Mississauga, Ontario. We are here to assist you in buying a garage door system, whether it is for a home, a business, industrial use or any other purpose. Our mission is to provide you with top quality products, and service which is quick and reliable. All of our garage door experts have vast experience when it comes to installing, maintaining and repairing complete garage door systems. Why choose B & M Garage Door Inc? We service residential and light‑medium duty commercial garage doors. We serve Mississauga, Burlington, Oakville, Acton, Milton, Brampton, Halton Hills, Georgetown. We look forward to serving you! There are two types of garage door openers. The first kind uses a chain for lifting whereas the second uses a reinforced rubber belt to do the same job. Both of these types of openers are reliable and get the job done, although the opener which uses a chain drive requires lubrication a minimum of every six months. 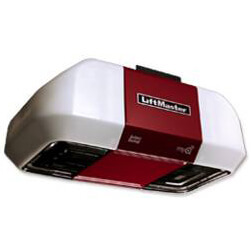 At B & M Garage Door Inc, our preferred garage door opener is LiftMaster, as they offer consistent quality products which are both durable and reliable. Over time, there are various garage door problems which you may encounter, though the most common ones are caused by blocked sensors, improperly aligned parts or radio transmitter batteries which have run down. Our specialists are trained to easily recognize these situations and to repair them efficiently, giving you peace of mind. 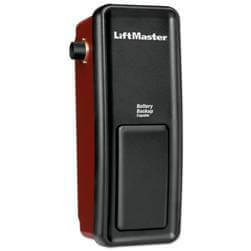 When it comes to safety features, the auto‑reversal mechanism is one of the most important aspects of a garage door opener. The job of this mechanism is to reverse the door if something blocking the door's path is detected. The mechanism has two important elements: on one hand, if the door hits an object while descending, the door physically detects its presence and reverses. The other mechanism is an electronic sensor which detects movement or obstruction in the door's pathway, causing the door to open once again as in the case of blockage. It is important to maintain both of these mechanisms as your safety may depend on them. A garage door is extremely heavy when descending and because of the risk of injury, it is important to ensure your safety mechanisms are working by having them inspected at least once every 6 months. By getting proper and regular inspections, you will ensure that your opener is in excellent condition and avoid any inconveniences. Another feature to consider is, during blackouts, the need for an emergency battery supplying your garage door opener if you want to be able to avoid having to manually open your garage door via the red emergency cord. For any questions regarding garage doors and openers in Mississauga, ON, B & M Garage Door Inc is here to help. In addition to normal repair and maintenance services, we also provide an annual tune‑up program which is designed to keep your garage door system functioning optimally during its whole lifespan. Just give us a call and we will send our team of experts to evaluate your garage door system needs. If you would like to schedule an appointment. or have any questions you would like answered, call us immediately!